ACE Medias Tools will look after sales, marketing, distribution, and customer service for OmniPlayer radio automation in France. 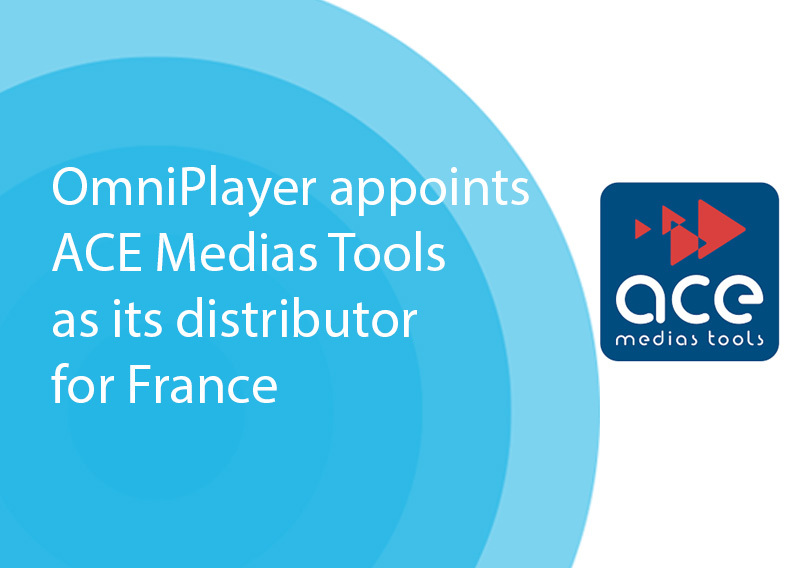 OmniPlayer continues to expand its distribution across Europe and has entered into a partnership with ACE Medias Tools, a Paris-based radio broadcast software specialist. ACE Medias Tools will be offering the full OmniPlayer Radio Automation suite to French radio customers, covering all the key segments of the radio production chain from ingest, production, scheduling to playout and multi-channel publishing, as well as OmniVeo visual radio to extend music playout with fully synchronised video clips. ACE Medias Tools will also provide customer support for all OmniPlayer products from its base in Paris. OmniPlayer will be on display at the ACE Medias Tools booth at the European Radio Show – Salon de la Radio – at the Grande Halle de la Villette in Paris, 24-26 January 2019. OmniPlayer is used by a fast growing number of leading European radio stations, including almost every Dutch commercial and public radio broadcaster. At the IBC show last September, OmniPlayer 3 was introduced with a new open architecture allowing users to create radio from any location and on any device, controlled by HTML5 thin clients. OmniPlayer will come to France with full French-language user interface. OmniPlayer is a complete end to end solution for professional radio stations, covering all the key elements of the production chain from ingest, production, scheduling to playout. It seamlessly integrates with third party solutions and guarantees high reliability, flexibility and cost efficiency. OmniPlayer is chosen by a rapidly growing number of leading European radio stations, including almost every Dutch commercial and public radio broadcaster, and has proven to reliably meet the demands of the fast changing and innovating radio business. OmniPlayer is created by Dutch radio solutions expert M&I Broadcast Services. For more information visit www.omniplayer.com or contact sales@omniplayer.com. Ace Medias Tools was founded in 2016 by industry veterans Arnauld Vallin, 30 years of experience in media, former Technical Director of the RTL France Group, and Cédric Maufroy, 22 years of experience, former Technical Director at RMC INFO. ACE Medias Tools aims to bring a changing approach to the French media industry with innovative own and third party software products to support radio broadcasters with their needs in the changing radio landscape. ACE recently launched its INES software for managing telephone calls during radio and television talk shows and Smart Codecs, the universal remote control of your set of audio codecs. For more information visit www.acemediastools.fr contact contact@acemediastools.fr.